For Dr. Alex Georgescu, dentistry is more than a profession, it is a lifestyle. A Dentistry graduate of the Medical University “Carol Davila”, dr. Georgescu has been a DENT ESTET team member since its foundation in 1999. In 2003, he joined the Department of Periodontology, Faculty of Dentistry as Assistant Professor, and three years later he completed his specialization in Oral Implantology, having managed to restore the smiles of hundreds of patients so far. 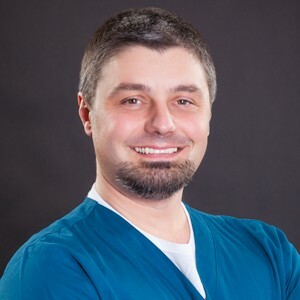 Dr. Georgescu is among the first in Romania to be certified in modern rehabilitation techniques of the Fast & Fixed by Bredent dental implant system. Equally, Dr. Georgescu took part in numerous research and is the author of over 20 scientific papers.